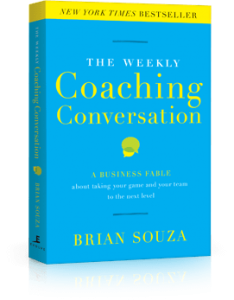 Ever since I heard Brian Souza talk about his book, The Weekly Coaching Conversations, at the Atlanta Leadership Summit in May last year, I’ve been experimenting with ways to include it in Bluewire’s routine. The core concept of the book is that as a manager or leader your primary focus switches from developing your own skills to achieve your results to developing your team’s skills to accomplish collective results. Brian shows how weekly coaching conversations can really help this process. This made sense to me, but putting it into practice – to call up each of our team and talk to them each week – seemed to lack purpose and focus. Would it just be a general chitchat? I didn’t like the sound of that, wasting our team’s time was not high on my priority list. I really didn’t want to call up and say: “So how’s everything going?” I was stuck and to be honest didn’t quite know what to do. So after a few attempts at the phone calls and feeling a bit redundant, I let it slide into the Too Hard (But I Have To Remember To Revisit Sometime) Basket. 8 months later, in February this year, I stumbled upon a reason to call everyone each week – the “Outcomes” section of our Topgrading Scorecards. Once each of the team had committed to the Outcomes on their Scorecards, it became absolutely clear as to what each and every one of us had to accomplish each week, month, quarter and year. This made the weekly coaching conversation really easy. Do you need to work from home for this? Is there anything else to talk about? The list of questions is really a response to what is happening at the other end of the phone line. If everything is on track, the call might take 5 mins. If there are issues to cover, it might take an hour. Everyone (including me) gets reminded of crucial initiatives like implementing Net Promoter Score across our events, Client Success Programs and Social Media Online. The important gets much more focus rather than just the urgent. We can tweak and clarify priorities and refine the Scorecards as we go (particularly since it is our first attempt at the Scorecards). I’ve locked in 3 hours each Tuesday afternoon to go through these as my #1 priority. If I had only 3 hours per week to work, these coaching conversations would be how I spend them.